stick and drinking a sprite zero. All of which is making me in a fantastically splendid mood. hours, thanks again for all of your sweetness! obsessed with these Dolce Vita sandals that I picked up from Free People the other day. I just cannot take them off my feet! They are perfect for my growing summer maxi collection. Well I hope you all are having a lovely day! Sooo in love with this outfit! Gorgeous outfit! Love the shorts and your shoes! :) You have such amazing style and are so inspiring! i love this :) beautiful color on you! i just love the colours in this outfit! so perfect! Beautiful outfit and the necklace is soo lovable!!! Congrats on the followers! You deserve it! I love this soft palette of colors. These shorts are great on you! Your sunglasses are absolutely darling! And such a pretty top from Dylana. Glad you having a fantastic summer so far, girl! And congrats on reaching the 3,000 milestone, yay! I LOVE the combination of colours! Your hair adds a really cool contrast. i love this look, its gorgeous, so floaty and summery! :)I am your 3000 reader! woooow. i completely love this outfit. as you said, breezy and perfect for the hot weather, but still super chic. lovely color pairing too. Peach is my new obsession. You look lovely! i love the color combination! it's soooo summery! loving the neutral-orangey tones you used here! Love everything about this outfit.. the colours are perfect! i love how breezy this outfit looks. congrats in hitting 3,000 you totally deserve it!! The colors in this outfit are just wonderful! You have such pretty peachy colors in your wardrobe. I really love those shorts you're wearing. I wish I had a pair! You've totally got me crushing on soft warm colors, Bonnie! Those pastels look gorgeous on you too. congrats on the followers, you definitely deserve it! I'm loving the colors in this outfit, and those sandals are adorable! the whole looks is so so wonderful and adorable! I love your new shoes, they actually look comfy! aw this is adorable! love your sandals!! Score, so lucky she gave you that top, it is so perfect for you! I love these colours on you, looks so pretty with your dark hair! i love your orange shorts. you looks so good. I adore this whole post! From the cheesestick & sprite zero to this darling outfit to your reaching 3000 followers! So cute! Congrats! You look LOVELY in this outfit - those colors look great on you, and CONGRATS on 3000 followers! I just became one :) thanks for the sweet comment on my blog and for visiting! gorgeous soft peachy tones. the sunnies are hot! Very pretty outfit!! So summery!! Also, congrats on the 3000 followers!! That's awesome!! I love this outfit and your sunglasses!!! Love your sweet outfit ! These shorts are lovely, it looks like the kind of outfit that will keep your good mood lasting all day long ! I love your outfit girl!! I just love that shirt so much!!! you looks so cute ! Gorgeous outfit, love the peachy pink color, and love the shoes! Love this outfit! I would never think of dressing pink and peach together! I love this outfit! Very soft feminine and pretty. You look lovely. Love the pastel color! The colors looks great on you! This is the first time I visit your blog, and this outfit is perfect, you have a great style! Thank you so much for stopping by, I'm following you now, hope to see you soon. The thought of you bobbing up and down is so funny. Congratulations on the big 3.0.0.0. Thank you for the awesome post about the boots. did you happen to tweet your UrbanMInx.com faves for the next giveaway. Talk soon. I'm so loving your blouse and shorts... so fab. Really cute outfit. Love the pastels and those shorts are gorgeous. really great look. I love everything in this outfit. I like the colour of the shorts. And they look really cool also, perfect on a warm day. Gorgeous outfit. Love the bag, & the shorts especially! 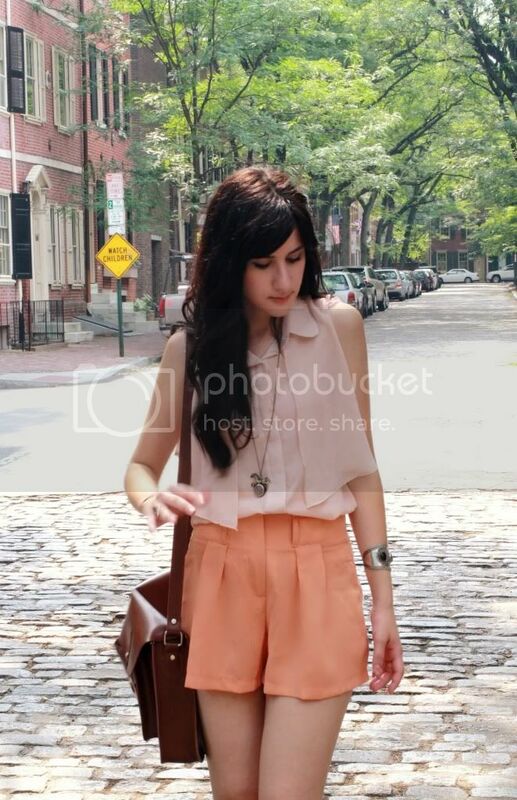 I love those peach sorbet colored shorts. Such a perfect outfit to wear on a hot day. You have such a cute blog, so I'm not surprised about the 3000 followers on Google. Congrats! I love everything about this outfit! The sorbet colours, the strappy and buckle-y sandals, and the pleating is perfection. Perfect for a blisteringly hot day! I love peach and pink on you Bonnie! You look incredible! These are probably my favorite summer colors. You look fab. 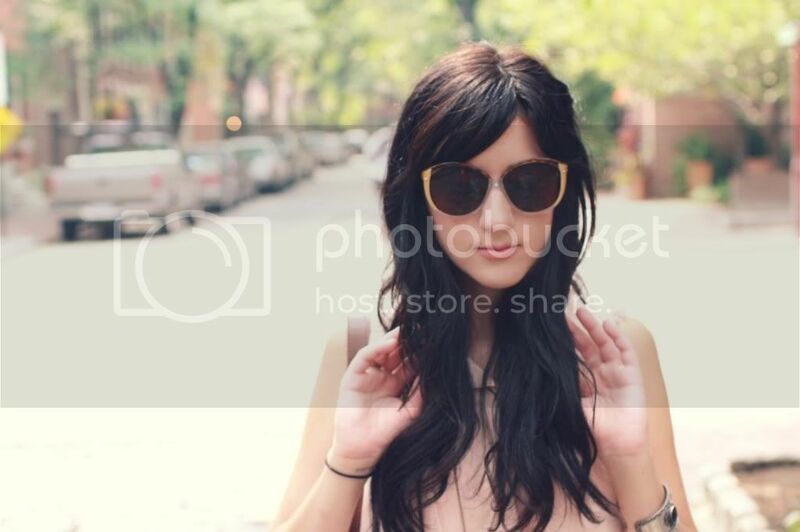 love the color combo of this outfit and your sunnies too!